Smart devices and gadgets have allowed people to become secretive and more discreet. For example, your child could be accessing age-inappropriate content over the internet or a mole at your workplace could be leaking valuable information. Or, people could be carrying on digital rendezvous on their iPhones. Screens have given people an advantage that allows them to get into activities they wouldn’t want other people to know about. Using an iPhone spy app has become a popular trend. People resort to using such apps to be in the know regarding their children, partners, and employees. Now, experts don’t recommend jailbreaking an iOS device because it brings a lot of changes on the monitored device; plus, your spying wouldn’t be a secret anymore. Although, jailbreaking does bring along with it a number of benefits such as unlocking cool features, installing third-party apps and altering the devices in ways not authorized by Apple. But, at the same time, jailbreaking the device would eliminate the security limitations that have been put in place by Apple for protecting it against malicious viruses, harmful apps, and attacks. Also, the user cannot upgrade his device to the latest iOS. Even some of the best iPhone spy apps have the prerequisite of jailbreaking the device which totally destroys the concept of spying on an iPhone. So, the best way would be to get an iPhone spy app that does not need jailbreaking of the device in order to perform well. There were no such options a few years back. But, now you can spy on an iPhone by getting Xnspy. Xnspy is a spying app that solves your dilemma of spying on an iPhone. There are no complicated steps involved, nor does it require technical knowledge for installation. All you need is to get your hands on the iCloud credentials of the users and you are good to go. What is so great about this app is that it delivers all of the information to you in real time. After you have installed this iPhone spy app on a phone you wish to monitor, you could access its text messages, call logs, browsing history, emails, multimedia activity along with all the locations that the monitored iPhone has been taken to. Xnspy would give you access to your own web account that takes you to an online dashboard so you could easily view everything that is going on the target iPhone. All of this can be done remotely. You don’t even have to touch the phone. You can get see all the activities of the monitored iPhone anytime whether from your smartphone or your computer. The fact that makes Xnspy rank amongst the best iPhone spy apps is the easy usage of this app. You don’t have to be a tech buff to get the hang of this app. The website has a live demo version for your assistance. Plus, you receive an email that walks you through the process. You will receive an email with your web account login details, a download link, and activation code. You only need to check the iPhone’s compatibility with the app which is not going to be a problem because Xnspy is perfectly compatible with all the operating system of the iPhone. The installation process merely takes 5-10 minutes of your time and no need to have physical access to the iPhone you wish to monitor. After you are done with that, the app begins to transfer the data from the iCloud to Xnspy’s online dashboard so you can see everything of the monitored iPhone. The dashboard serves the purpose of a map that makes it convenient to navigate through the app. It features a simple and easy to understand layout. There are two things that you are required to take into consideration before you begin to use Xnspy iPhone spy app. You will need the iCloud credentials (Apple ID and password) of the monitored iPhone. Also, make sure that the iCloud backup is enabled. This option is enabled in most case. If it isn’t, then you will have to enable it in order to use the app. Xnspy lets you everything. It is a secure app that you can trust completely. It is a silent app that works in the background and does not hinder the performance or working the monitored device. The user will have no idea that his device is getting monitored, it is that discreet. Xnspy isn’t only a compatible and proactive iPhone spy app but an affordable one as well. Users get to choose from a Basic or Premium edition for their monitoring needs. The app gives you the option to make a choice from monthly, quarterly and annual subscriptions. 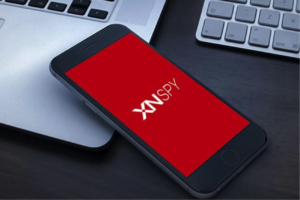 Xnspy made its place among the best iPhone spying apps because it not only caters to your basic monitoring need but offers a variety of impressive advanced features as well. You can view both incoming and outgoing messages of the iPhone you are spying on. The dashboard lets you see the messages with their complete contact details along with time and date stamp. You can also view the deleted messages if the app has created a backup. You can view all the call details of the monitored iPhone. Apart from the incoming and outgoing call details, you can also see the frequent callers in the form of Top 5 Callers and the duration of their calls with contact details, date and time stamp. With Xnspy, you can see the activity of instant messaging apps as well. It lets you access the instant messages and the multimedia which the user sends or receives using the different instant messaging apps. Xnspy supports Facebook Messenger, WhatsApp, Kik, Tinder, Instagram, and Skype. You can also keep tabs on the chats by setting alerts on certain contacts and words and adding them into the Watchlist. The app would send you alerts when they appear in any text conversation. You can also monitor the emails on the default email app of your monitored iPhone. Along with that, you can access the Top 10 Websites which the phone user frequently visits. You can monitor all social media activities as well. Xnspy doesn’t only give you a digital peak into the iPhone you are monitoring but, gives you the ability to remotely control the device as well. You can view and/or block the installed apps, lock the phone, switch it off and even wipe off data from the iPhone you are monitoring. You can monitor the real-time location of the iPhone you are monitoring. With the GPS location tracking feature of Xnspy iPhone spy app, you can access their current location as well as the locations they have been to in the past. With the help of a computer or smartphone, you can access this information anytime. The geo-fencing feature lets you know when the phone user enters or exits a certain area. You can set boundaries and add specific locations in the Watchlist. Xnspy runs smoothly on all iOS versions. It is compatible with all versions of iOS and supports iOS 6.x, 7.x, 8.x up to 12.0.1 that makes it rank in the best iPhone spy apps. Some people are not adept in using smartphones and other gadgets. Using a spy app is a completely different story. But Xnspy’s customer support takes care of that and makes sure that you have a smooth experience. If you need any guidance regarding installation or any other function of the app, you can get in touch with a customer support representative team who is at your service 24/7. The team is responsive and guides you expertly about the working of the app. All of this adds to the overall user experience. The app is simple and user-friendly. You can view the live demo version on the official website to get a better understanding of the app. The customer support happens to be available 24/7. The users enjoy a vast variety of basic and advanced monitoring features. The app is equipped with offline tracking feature. Xnspy does not offer a trial version. There is no remote camera control feature. Due to poor internet connection sometimes, the data syncing process becomes a bit slow. Xnspy iPhone spy app offers an extensive variety of basic and advanced monitoring features. It delivers great value for money. Along with that, it provides the ease of use which most of the apps lack. No other app is offering such features at this price. Furthermore, the option of offline tracking is a plus. It keeps collecting data and, as soon as the monitored iPhone connects to the internet, the app uploads the data to your web account. Because of its range of great features and affordable prices, it has become one of the best iPhone spy apps in a short of span of time. Previous articleApple iPhone XR vs Samsung Galaxy S10e: Which one is right for you?